Taken from eBay. This is NOT my photo. 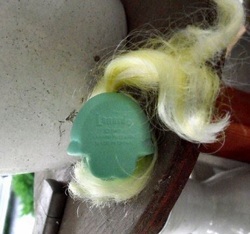 Lanard has been making ponies since the 1980s. However, the vintage Lanard ponies look a bit different from the more modern ones. Lanard ponies are of a slightly better quality than most fakies, and they come in all kinds of designs and colors. Some look more realistic, while others are completely fantastical. 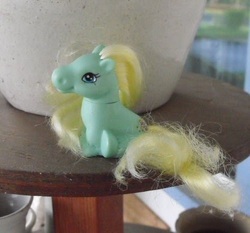 These ponies are fairly well favored among fakie collectors. The vintage Lanards are somewhat sought-after. Their hair isn't always the greatest quality, but I like to think of Lanards as MLP competitors, because of the many different designs and poses and the general good quality. Baby Lanards come in a seated pose. This is the new FairyKins set, currently a holiday toy for sale at Dollar General as of 10/19/2010.